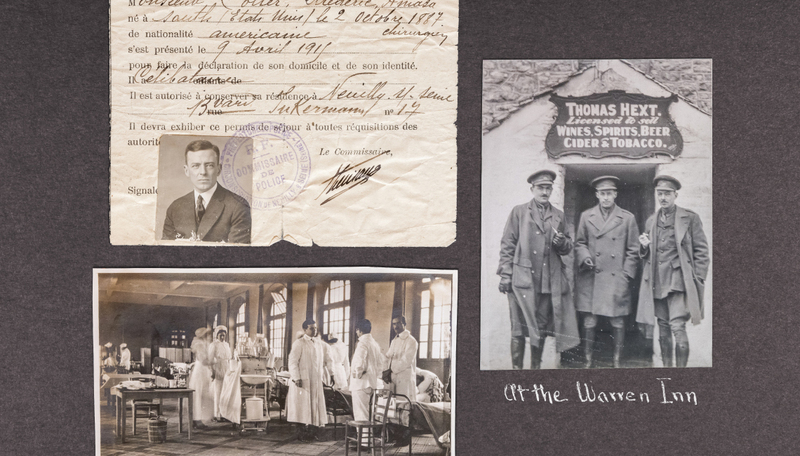 In the early stages of World War I, before the United States entered the conflict, American physicians volunteered to care for soldiers in French and English hospitals. Frederick A. Coller, who was to become one of the most renowned University of Michigan surgeons, first volunteered as a member of the Harvard Medical Unit. He served in France and England, and then later as a member of the United States Army during the last stages of the war. Coller documented his service in albums filled with the photographs and mementos he collected. His albums are now kept in the U-M Bentley Historical Library. Pictured here at top right is Coller’s initial travel document. At bottom left is an image capturing life inside a wartime hospital ward. And, at bottom right, Coller (at right) poses in front of the Warren House Inn, a pub still standing in rural England.